This week we had the official Open House and Ribbon Cutting Ceremony in our newest addition to Inn at Quarry Ridge, Stonehem Hall. 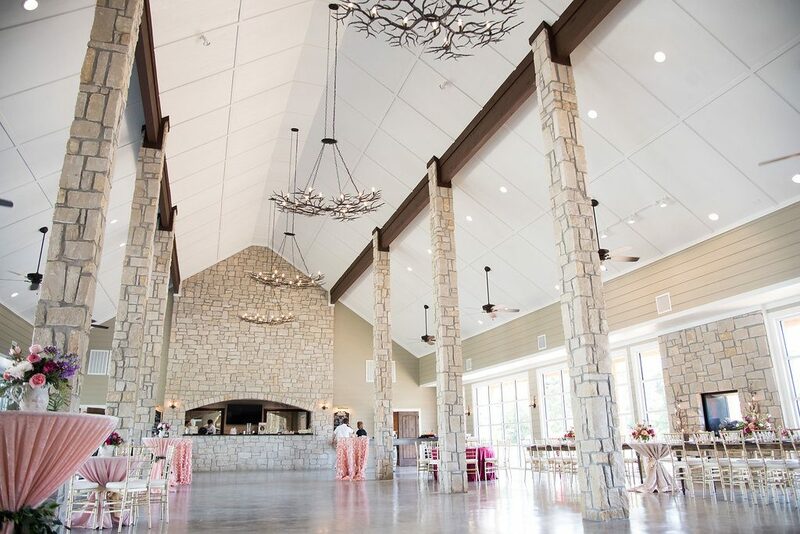 This expansive indoor event space adds a comprehensive option for those looking for a wedding venue in the Bryan, College Station area. 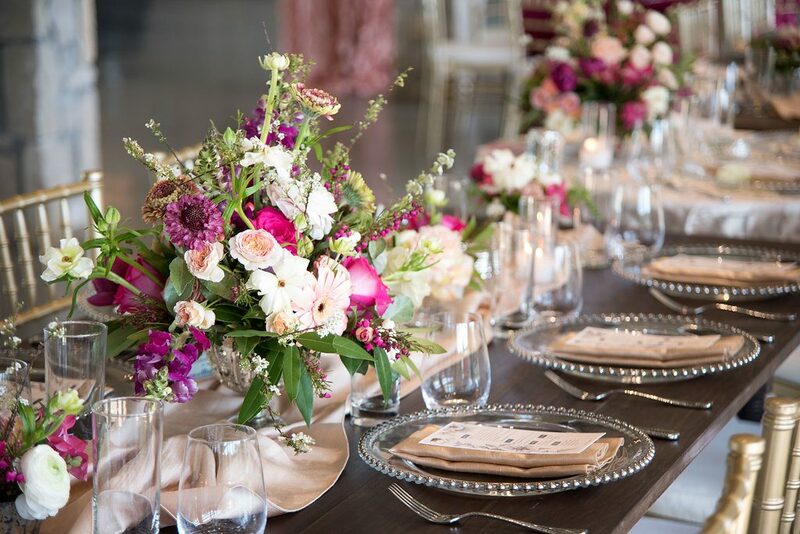 To kick off the new space and inspire future brides, Epoch Co+ coordinated a fabulous “Spring Soiree” theme to bring the wedding venue to life, and we are so excited to show you the final images from San Angel Photography! 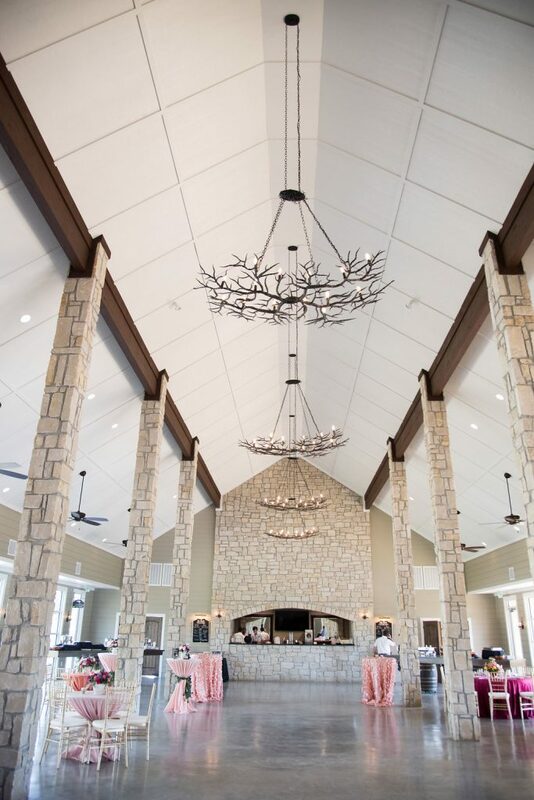 Stonehem Hall is our newest 5,000 square foot indoor reception venue with soaring ceilings, natural lighting, floor-to-ceiling windows, stunning waterside views of the pond, rockwall fireplace and so much more! The wall of windows on either side allows natural light to pour into the event space for effortless images! After saying your, “I Do’s” at our Gazebo, the waterside deck creates a gorgeous backdrop at sunset, and the ideal spot for cocktail hour. 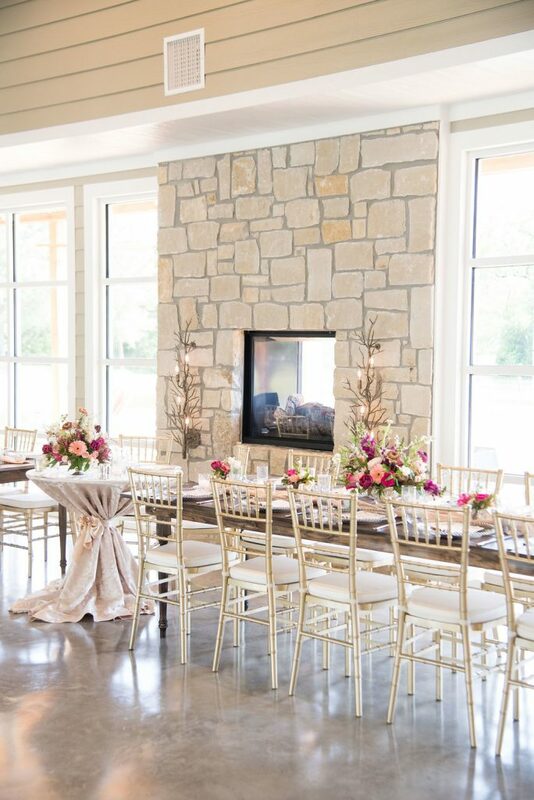 Our ideal spot for a sweetheart table and head table is against the double-sided stone fireplace. 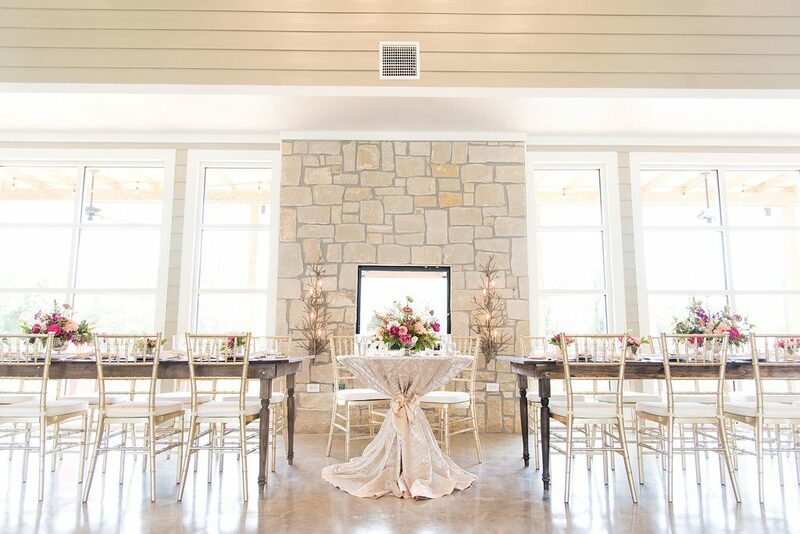 To create an upscale, statement area for the sweetheart table and head table – we flanked the sweetheart table by the rich wood farm tables hand-crafted by Vestige Event Rentals, which can seat up to 12 guests each! To set the tables, we used Ashley & Co’s gold chiavarri chairs, silver-beaded chargers and to carry over the mixed metal look, Epoch chose to use their khaki napkins and runners. 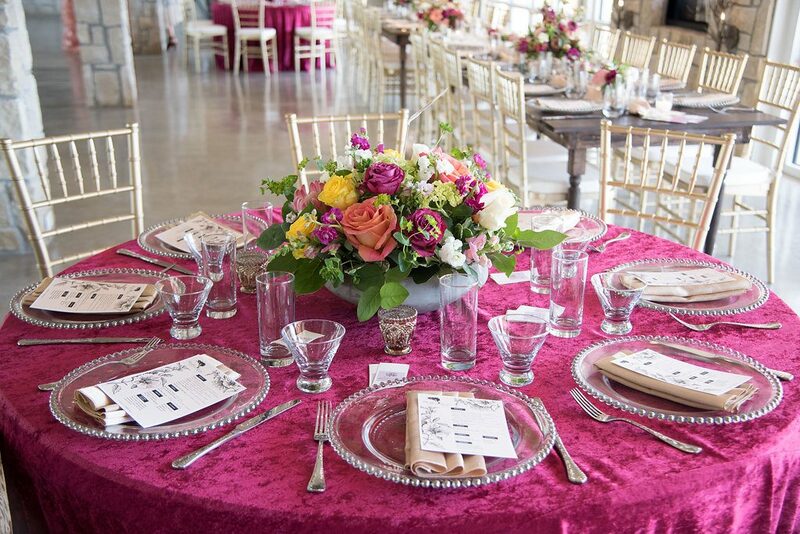 To soften the look, a blush patterned linen, sashed with the same khaki accent color were used for the sweetheart table. 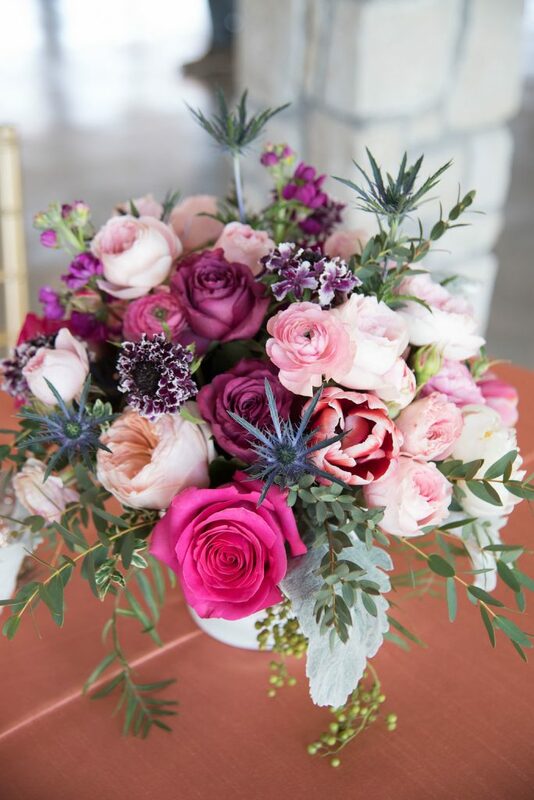 Willow Lane nailed the color palette with their vibrant florals of blush, punch pink, peach, boysenberry and hot pink. For the Farm tables we had a large organic, garden-style focal piece, flanked with smaller arrangements and votives. 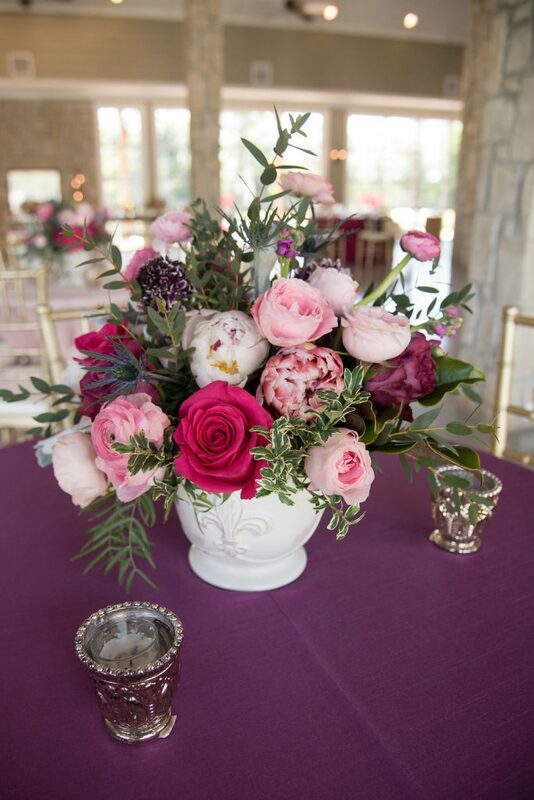 The Sweetheart table had a similar bold floral arrangement to contrast the softer linen color. 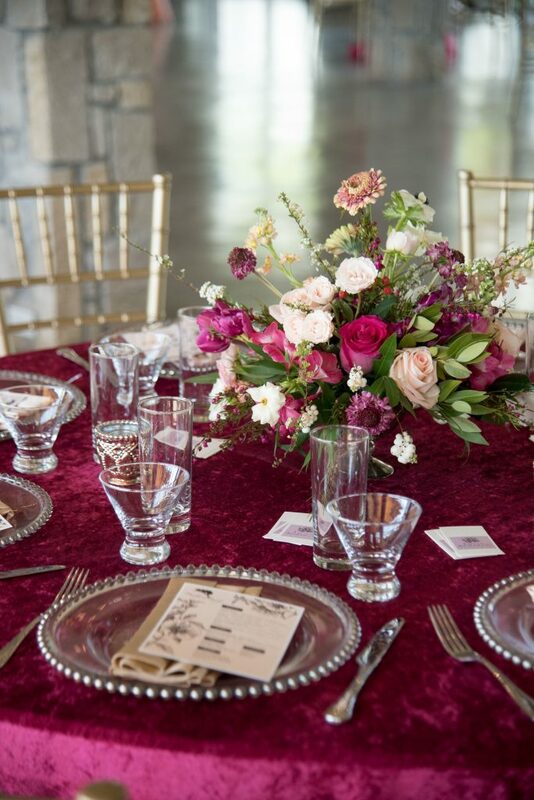 For the guest tables we wanted to bring out the bold boysenberry color with Ashley & Co’s velvet linens. 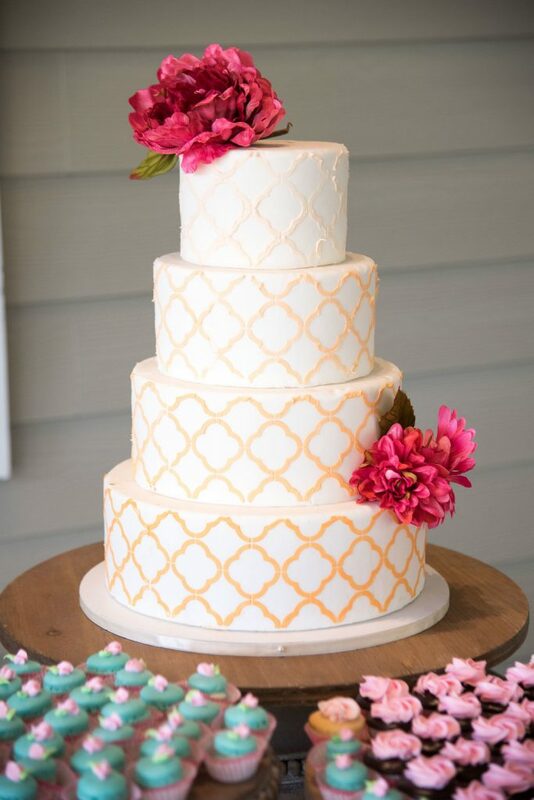 Tricia Barksdale added in some fun pops of canary yellow and tangerine with a low-lying modern vase, and Willow Lane had the garden florals with monochromatic pinks. With the Open House and Ribbon Cutting being a joint event, we knew there would be a lot of mixing and mingling by the guests in attendance. We intermingled cocktail tables with seated cafe tables to ensure guests had plenty of options when sipping cocktails and enjoying hor d’oeuvres. The cafe tables had 4 different bold colored linens provided by Details. We incorporated the ever-popular blush wedding color through the 8 cocktail tables ranging in luxurious velvet by Party Time Rentals, blush petal tafetta by Details, and blush lacoste from Ashley & Co. We love how well these tables came together with June Votives by Vestige Event Rentals and lush florals by Post Oak Florist. 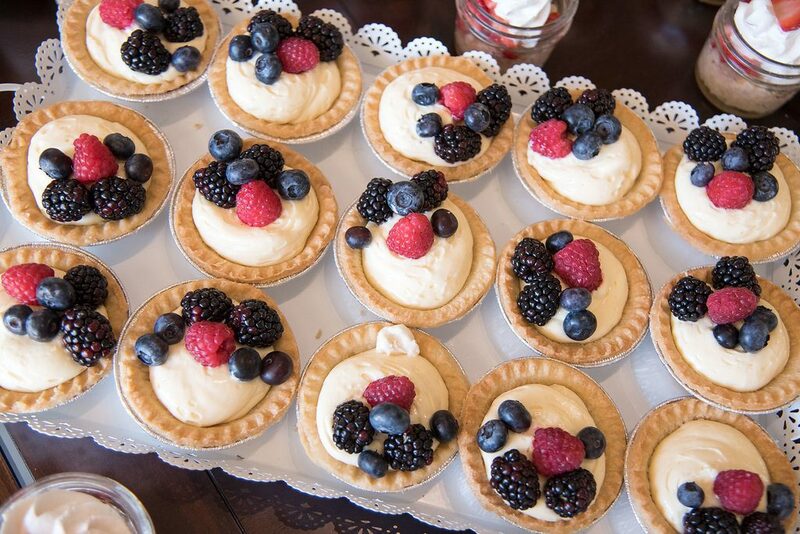 We were honored to have 3 of our favorite food vendors in attendance providing light bites for guests to enjoy – Buppys, Epicures Catering and D’vine Cuisine. 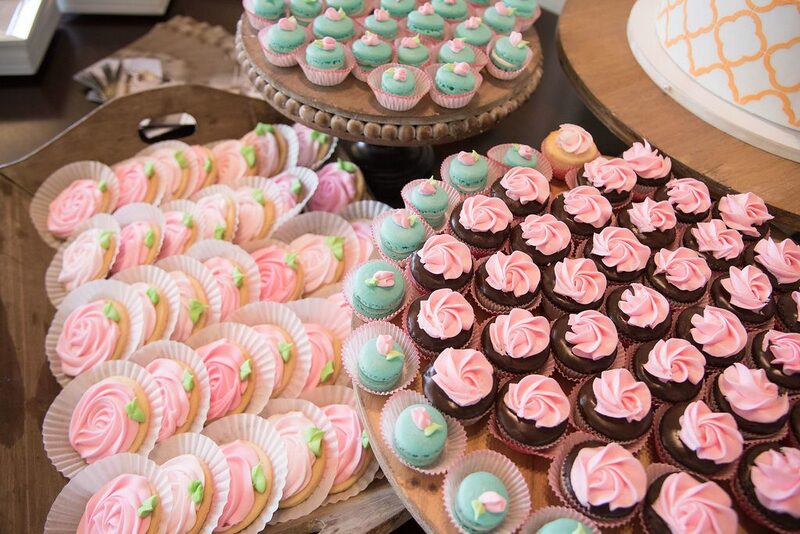 Sandee’s Sweets and Fabulous Fare also provided a wide spread of sweet treats carrying over the “Spring” theme for guests to enjoy! 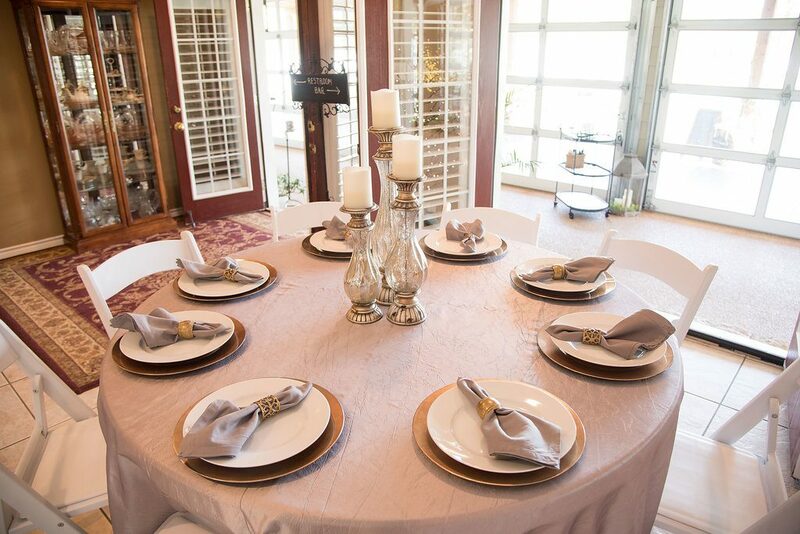 Our venue comes with coordinating farm tables for guests to utilize during their events. Our 9′ espresso stained table is the perfect option for desserts, and 2 12′ tables on rolling wine barrels are easily moved around for catering companies to utilize. The Great Room carries over the expansive ceilings and stone fireplace incorporated into Stonehem Hall. For added enjoyment, this space also features a 12 ft dining table, 60” HDTV, blu-ray, Xbox, Wii, and board games. With plenty of space and a comfortable living area, this space can be used for a bridal party gathering before the ceremony, a family creating new memories together, fellow Aggie fans enjoying their game day weekends, and social groups getting to know each other in this encompassing space designed for elevating each event and weekend experience. 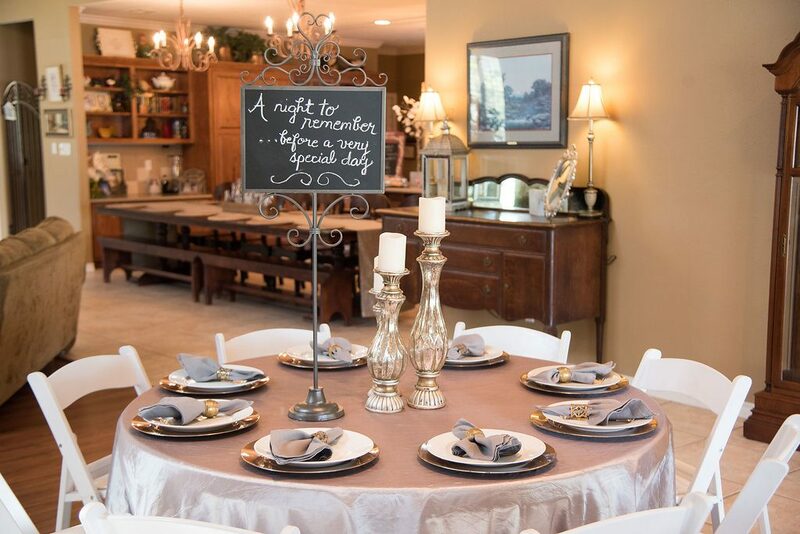 It also serves as the perfect space for Rehearsal Dinners for those who book the inclusive Marble Package. The Great Room carries over the wonderful windows by overlooking the fabulous pool area where brides regularly enjoy sipping mimosas by the pool the morning of the wedding with their favorite wedding attendants, waiting for the festivities to begin! Love everything you see? Our Marble Package is the perfect option for those looking for an all-inclusive option! Request more information about pricing, packages and availability! The official Open House and Ribbon Cutting Ceremony was a huge success and we thoroughly enjoyed meeting each and every one of you who came to celebrate the addition of Stonehem Hall to Inn at Quarry Ridge. We hope these inspirational images by San Angel Photography entice you to come out and tour everything we have to offer! We can’t wait to celebrate with you! 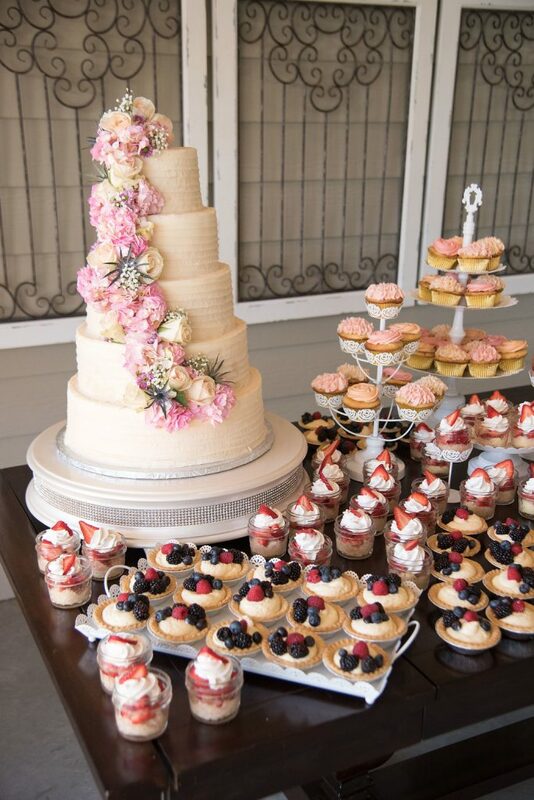 Explore recent events & weddings in Stonehem Hall! We had such a wonderful time! Thank you for making our day so special!